These gloves are 6ML thick therefore stronger than ordinary nitrile gloves. The gloves are flexible, have textured fingers and are comfortable to wear. The long cuff offers greater protection. You can also wear them over your normal beekeeping gloves to help protect them to last longer. 1 box of 100 gloves = 50 pairs. 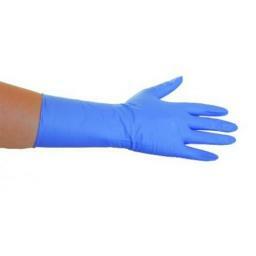 please note that these gloves are indigo in colour (they look blue in the first image).